Jigeum I Sungan secured the final leg of the Korean Triple Crown in emphatic fashion at Seoul Race Park this afternoon and in doing so, assured himself of the title of Champion three-year old of 2012. The Korean Derby winner beat out the Oaks winning filly Rising Glory and KRA Cup mile winning colt Gyeongbudaero to win the Minister’s Cup by four lengths and become the first horse since the Triple Crown winning J.S.Hold in 2007 to win both the Derby and the Minister’s Cup. Sent off as the 2/1 favourite, Jigeum I Sungan – “This is the Moment” in English – was kept in the middle of the pack for the first half of the 10 furlong race. Jockey Moon Se Young asked the Derby winner to improve around the home turn and as the entered the home straight, all the big contenders were massing. Gyeongbudaero was on the inside under Joe Fujii and Nobel Pokpung, a fast finishing second in the Derby looked poised to strike under Gerrit Schlechter on the outside. They had nothing on Jigeum I Sungan though who accelerated away for an untroubled win. 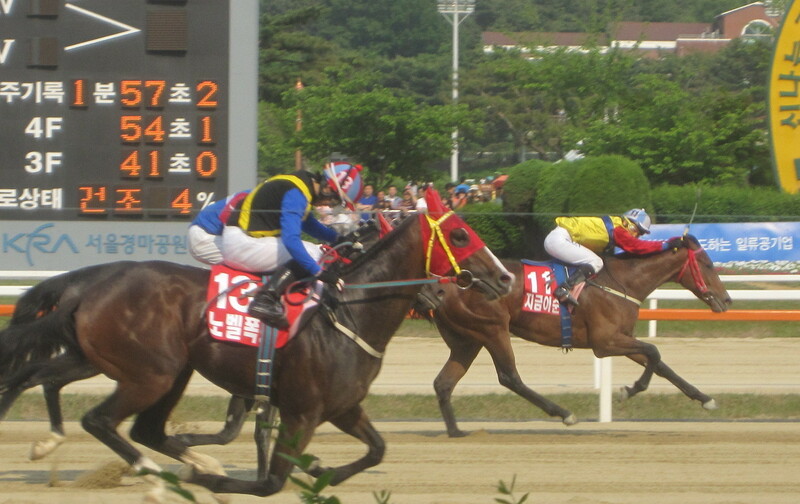 Oaks winner Rising Glory finished fast down the outside to grab second place, a neck in front of Gyeongbudaero. So things ended as they should. The Derby winner finishing first, the Oaks winner second and the KRA Cup Mile winner third. Today, however, Jigeum I Sungan was best in all departments. Further clashes look likely and it will be fascinating to see if he is ready to take on the likes of Dangdae Bulpae in the President’s Cup in a month’s time. Even with the weight advantage that he’ll have, it may be a little too early. For jockey Moon Se Young, it was another golden day following his win in the Singapore Turf Club Trophy yesterday. It was his second Minister’s Cup, having won the 2004 edition on Mupae Gangja. Jigeum I Sungan is the first Seoul-based horse to win the Minister’s Cup since J.S. Hold in 2007. Gaeson Janggun in 2008, Namdo Jeap in 2009, Dangdae Bulpae in 2010 and Dongseo Jeongbeol in 2011 were all trained at Busan. Jigeum I Sungan is the first of his until now unfashonable Japanese bred sire Ingrandire (White Muzzle) to become a big star on the track. Ingrandire was imported to Korea in 2006. The winner’s dam, Solmaru (Mujaazif) finished third in the Korean Oaks in 2003. Her four previous foals all went onto win. The 2007 edition turned out to be J.S. Hold’s last race. Jigeum I Sungan isn’t in his class just yet, but on today’s evidence, he’s going to be a lot of fun to watch in future. Even though there are only two tracks, it’s not easy to win a Triple Crown in Korea and there isn’t one on the line as a full field of fourteen line-up for the final three-year old Classic of the season, the Minister’s Cup at Seoul Racecourse this Sunday. The winners of all three Classics run so far this year will be there. Gyeongbudaero, who won the KRA Cup Mile (the Korean 2000 Guineas) way back in April will be joined in the starting gate by Derby winner Jigeum I Sungan and Oaks victress Rising Glory. However, these three will be up against a number of new challengers who weren’t ready for the early season classics but have been coming into form since. It is a big weekend of racing on the peninsula with Seoul playing host on Saturday to the Singapore Turf Club Trophy. One of only two fillies in the race, she didn’t start showing her quality until this summer and finished second to Yeouiju in the Donga Ilbo Stakes three weeks ago. Will need to find plenty more to win here but the extra furlong could suit. BOunced back from a disappointing ninth in the Cup Mile to have a good summer. Finished ahead of some good horses when running second in a class 1 handicap last time out. Broke his maiden in April and lightly raced since. Likely to be one of the outsiders but has never finished out of the placings and appears to be improving with each run. The most expensive horse of his crop at the two-year old sales last year, he was comfortably beaten by stablemate Fine Fine last time out. However, that was at 1400M, He;s never been tested around two turns so is something of an unknown quantity but has plenty of talent. Hasn’t competed at higher than class 3 although was a comfortable winner last time out. Distance should suit but he won’t be one of the favourites. A Class 1 winner on his last start, he has a lot of quality. However, while he has won a class 4 race at 1500M, he looks a pure sprinter and may struggle to get the distance here. Inconsistent and yet to win at higher than class 4. While he will most likely appreciate the distance, it would be a surprise if he was to rectify that here. The Korean Oaks winner hasn’t run since her victory in the fillies’ classic in August. 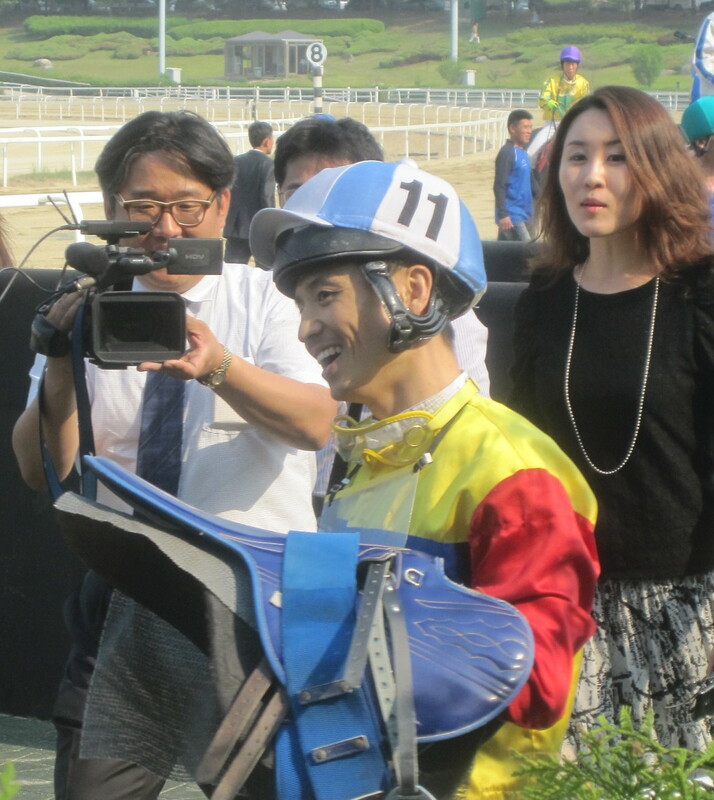 However, Union rules prevent jockeys who are riding at Seoul on a Sunday from riding at Busan on a Friday and it is unlike Jo Sung Gon to give up the prospect of a lucrative weekend at home unless he thought he had a chance. Hasn’t won since the KRA Cup Mile in April. He was third in the Derby and a very creditable second behind five-year old multiple STakes winner – and winner of thsi race two years ago – Dangdae Bulpae, in the Busan Owners’ Cup last month. If he repeats that form, he has to be taken seriously. Should benefit from Joe Fujii being in the saddle. An interesting one. Although he has recently been running in sprints, he has a victory over 1800M to his name and should be capable of competing here. A placing chance at possibly good odds. The Derby winner won at the distance in a class 1 handicap last time out and that could be enough to make him favourite here. That was only his second start since the Derby so he shouldn’t be burned out and he has every chance of winning his second Classic. The only horse in the race by a Korean born sire (although all the others are Korean bred), he was fourth behind Dangdae Bulpae and Gyeongbudaero in the Busan Owners’ Cup. Outside chance of a place. Roared into form this summer and comes into the race on a run of five consecutive wins. He’ll have to find a little bit more to win here but he has every chance of doing so. An unexpected second in the Korean Derby, he may have won had the race been an extra furlong. He’s got that extra furlong and, while he was well-beaten by talented US import Smoking Gun in his last start, he should relish this company. South African Gerrit Schlechter rides at Seoul for the first time since winning the International Jockey Challenge in 2007. He’s ridden Nobel Pokpung just once before and they won. Seoul Race Park: 11 races from 11:00 to 17:55 including the Minister’s Cup at 16:15. Less than two months away from the Korean Oaks, we’re no clearer to finding a winner if today’s disappointing renewal of the Sports Seoul Stakes was anything to go by. Although the winner, 11/1 chance Powerful Miss G, can hardly be blamed, there were few other positive performances. As a filly who finished seventh in the Derby in her last start, Powerful Miss G perhaps should have been given more respect by punters. Instead they opted to make the undoubtedly talented but frustratingly inconsistent Cheoneun close to even-money favourite. Unfortunately for those punters, while she and Jjak Kkung looked great sprinting for the first corner, the pair of them looked less great when they inevitably paid for their exertions in the home straight, weakening badly as Powerful Miss G led home a train of fillies down the outside. It was short train though. All In Win was eased out of the race in the last furlong while Recent High lost interest in the back straight. There was nothing wrong with her as when Cho Kyoung Ho finally got her moving in the right direction she recorded the fastest final furlong time. Probably due to being well-rested. Both All In Win and Recent High will receive a ban and neither will feature in the Oaks. Trailing Powerful Miss G by 7 lengths was Dolpung Jilju, a return to form of sorts for a filly who was great as a 2-year-old but has been dreadful this term. Speedus, who has at least been consistent, albeit in being consistently average, grabbed third. While a match-up between Powerful Miss G and Busan’s Grand Teukgeup will be worth watching, this year’s Oaks, which will be run at Busan in August, is not yet setting the pulse racing. There was disappointment for another filly at Busan today as Dongteuja (Montbrook) saw her unbeaten record end at 6 in emphatic style. Not that it was any surprise or disgrace for the 3-year-old half-sister of double Grand Prix winner Dongbanui Gangja. Dangdae Bulpae (Biwa Shinseiki) looked back to his devastating best as he strolled to a 9 length victory with Dongteuja a well beaten fourth. Dongteuja has time on her side though and was up against a classy field of older horses. We’re still nearly two months away from the Korean Oaks but Seoul’s top three-year old fillies will face off against each other this coming Saturdayin the Sports Seoul Cup, the capital’s top trial for the filly Classic. 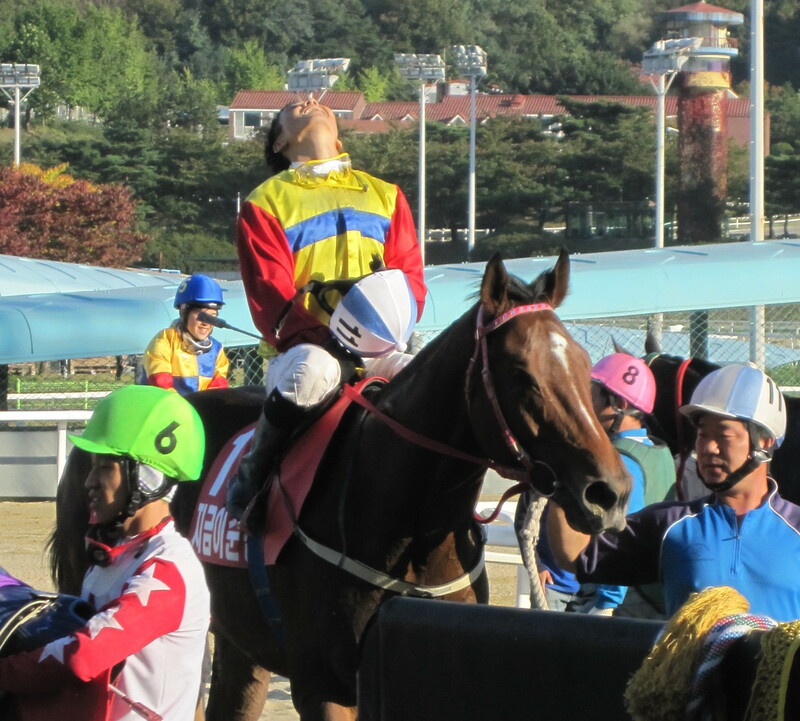 Cheoneun winning earlier this year – can she find her form again in the Sports Seoul? Just nine will run in the race, which will be contested over the Oaks distance of nine furlongs. Cheoneun and Dolpung Jilju are the best known having first made an impact as two-year olds last season. Both were well-beaten in the Derby as were Powerful Miss G and Jjak Kkung. Improving filly – and commentator’s nightmare – I Love You, will have claims as will Recent High and Dodo Gongju, who’s won four of her six starts. See below for a full run-down of runners and riders. Down at Busan another three-year old filly headlines the main event. ALthough born in Korea, Dongteuja (Montbrook) was sired overseas and therefore isn’t eligible for the Oaks. If she were, she’d be hot favourite and on Sunday afternoon her unbeaten record of six wins from six starts is on the line against class 1 opposition for the first time. And she’s going to run slap-bang into two-time President’s Cup winner Dangdae Bulpae (Biwa Shinseiki) in what is going to be by far her toughest test to date. Japanese jockey Narazaki Kosuke gets the ride on the filly. Jigeum I Sungan ended Gyeongbudaero’s Triple Crown bid with a cool one-length win in the 15th Korean Derby at Seoul Race Park this afternoon. Sent off fourth in the betting, and ridden by Moon Se Young, Jigeum I Sungan made his move as the field entered the home straight and, while KRA Cup Mile winner and favourite Gyeongbudaero looked menacing on the outside and briefly hit the front with a furlong to go, Jigeum I Sungan was always travelling the better and was superior in the sprint. 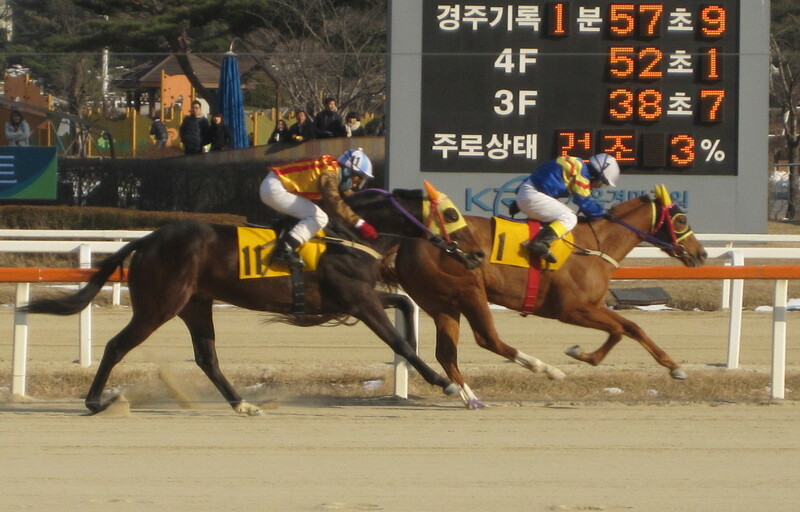 Gyeongbudaero was even pipped for second as Nobel Pokpung, seemingly tailed off in the back straight suddenly appeared from nowhere under Japanese jockey Narazaki Kosuke to end up as the winner’s nearest challenger. 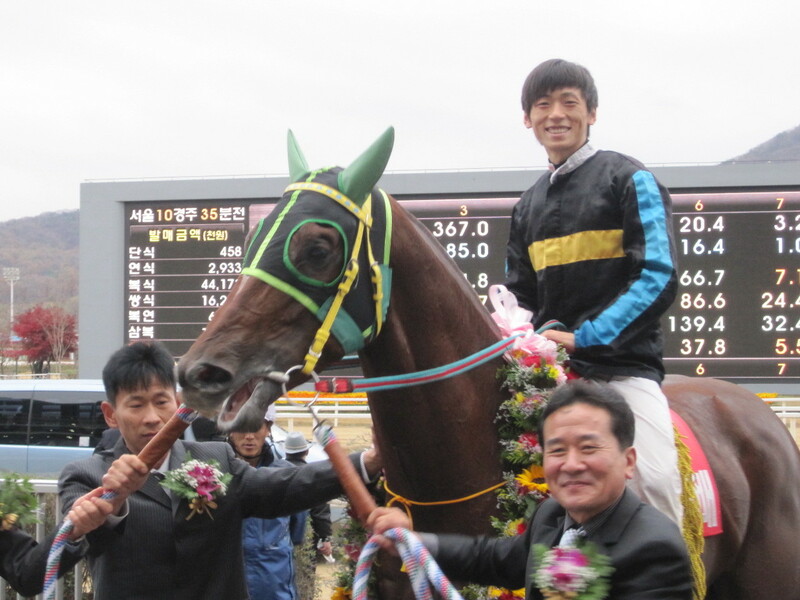 It was a first Derby victory for jockey Moon Se Young and also for trainer Ji Young Cheol. Thirty-one year old Moon is the runaway leader of this year’s jockey championship and previously won the 2007 Grand Prix Stakes on Bally Brae. He’s married to KRA TV Announcer Kim Ryeo Jin and the couple celebrated with their baby daughter in the winner’s circle. As for Ji, a former jockey and now twenty-five year veteran trainer, although he has saddled Stakes winners before, this was by far the biggest. 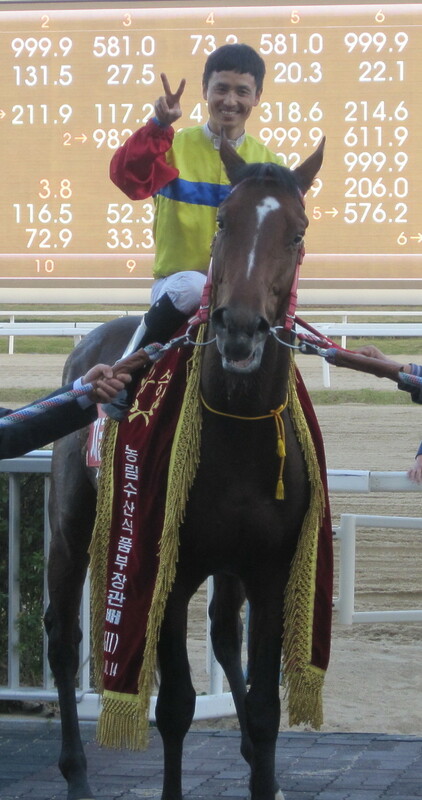 Jigeum I Sungan (Ingrandire) finished 5th in the first leg of the Triple Crown, the KRA Cup Mile, last month. Up until then, however, he had been showing consistent improvement with every start. Translated into English, his name means “This Is The Moment” and is taken from the musical “Jekyll & Hyde” (in Korean the “I” in the middle of his name is pronounced as “ee”). 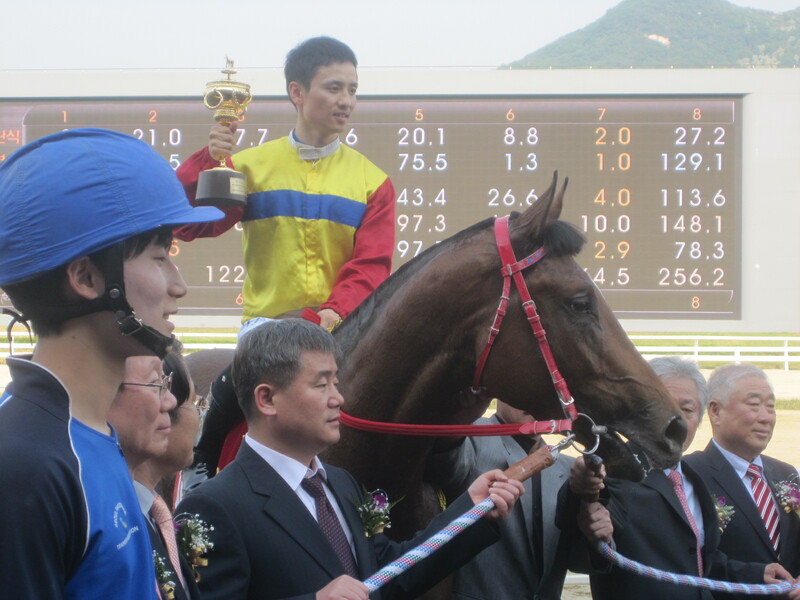 So J.S.Hold remains the sole winner of the Korean Triple Crown for at least another year. Gyeongbudaero gave it a go, but it wasn’t to be today. The surprise of the race was Nobel Pokpung and, while Narazaki Kosuke put in a good ride, it is tempting to speculate on just how close he might have got to the winner had he not been left with so much to do. Good Time ran to form in fourth but the five fillies were disappointing, Powerful Miss G, the first one home in seventh while Cheoneun, so impressive three weeks ago, was last. For the second consecutive year, a Seoul horse has won the Derby. However, Busan horses filled out the next three places and when this generation reconvenes for the final leg of the Triple Crown, the Minister’s Cup at Seoul in September, they will surely be back to challenge once more. For now though, the stage belongs to Jigeum I Sungan. This is his moment. This is his day.